The improved Packers defense is well-positioned to handle the loss of its leader. 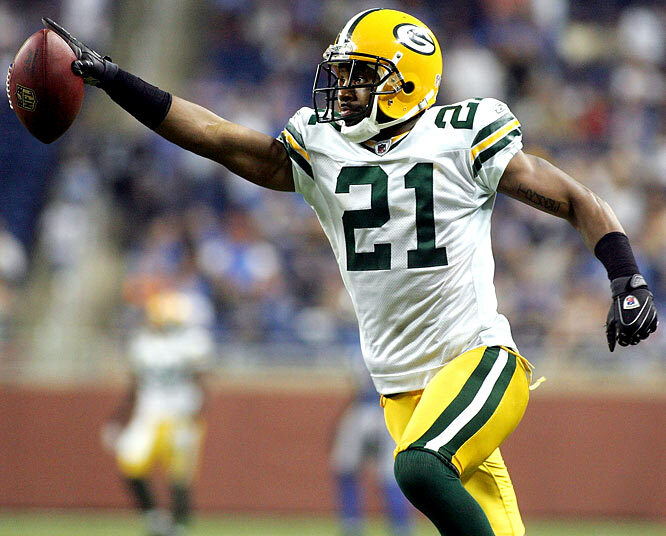 News broke mid-afternoon that Charles Woodson is out for 6-weeks due to a broken collarbone, the same collarbone he broke in Super Bowl XLV. It’d be fair to think that replacing an 8-time Pro Bowler, 2009 Defensive MVP, and a pure playmaker in the secondary would be difficult for a defense fresh off putting together one of the worst statistical seasons ever for a collective defense. Amazingly, that’s not the case with this new and young defense. At age 36, there is no denying the fact that Woodson has lost a step. Because of this, he moved to safety in the base defense and plays the slot in sub-packages. His savviness, game knowledge, and veteran leadership have enabled him to seamlessly make this transition. But, his stats bear out the fact he’s not the player he once was. In the 7 games so far, Woodson has only 1 INT, 1 FF, and 1.5 sacks. His tackling numbers are consistent with years past, though he has more assisted tackles this year already than all of last year. These numbers support what the eye can see. He’s simply not the playmaker we’ve grown accustomed to over these past seven seasons. And he’s been getting called for holding and clutching WR’s like he hasn’t in years past. In Woodson’s place will slide a number of young and talented DB’s. In the base package, you can expect more Jerron McMillian and M.D. Jennings, the same safeties that take over in the sub-packages. McMillian is the more willing tackler of the two and has already shown a knack for being strong in run support. I expect to see more of McMillian in the base for this reason. In sub-packages, which the Packers play greater than two-thirds of the plays, the Packers are sitting pretty with four young players that have proven they belong: Tramon Williams, Sam Shields, Casey “All I Do Is Catch Interceptions” Hayward, and Davon House. Of course, Williams will man the outside along with Shields when he returns. Hayward will get the nod for Woodson’s role. This is a fitting replacement given Casey’s knack for the ball. And when the Pack go dime, they still bring in Davon House – who very well could be the starting CB in place of Shields had he not gotten injured. In his first game back, House showed well last weekend with strong, physical play, and showing mostly tight coverage. Needless to say, the Packers are well-stocked with four players that could all start for many NFL teams. The biggest unknown will be how much Woodson factored into getting the defense aligned pre-snap. It will be incumbent upon Morgan Burnett and Tramon Williams to become the vocal leaders in the defensive backfield. It is also worth noting that the Packers’ schedule sets up nicely for the six games Woodson will miss. Two games remain before the bye week. Both at home, against offensively challenged teams. Off the bye, the Packers travel to play the free-falling Detroit Lions. The toughest game will be the following weekend at NYG. But then, the sixth week is a home game against the Vikes, who also have challenges in the passing game. If the original prognosis is true, the Packers are well positioned to handle these next six games. Let’s be clear: Charles Woodson is a special player that, even at an advanced age, brings a lot to the table that cannot be replaced. He’s a pro’s pro and the veteran leader on a young team. Though he’s lost a step, he’s savvy and has made game-changing plays few others could make. But, with a stable of young talent in the defensive backfield, the Packers are well-positioned to handle the six weeks without their defensive leader. This entry was posted in Home, Vikes v. Pack and tagged 2012 Green Bay Packers, Casey Hayward, Charles Woodson, Davon House, Green Bay Packers defense, Jerron McMillian, M.D. Jennings, Morgan Burnett, Packers defense, Packers injuries, Sam Shields, Tramon Williams, Woodson's injury, Woodson's replacement. Bookmark the permalink.